Welcome to Hugs for Our Soldiers! HUGS is a 501(c)(3) nonprofit organization whose mission is to support our troops serving overseas. We provide a touch of home to our troops by sending care packages, letters and cards and offer to the American people the opportunity to adopt and care for a deployed Soldier, Marine, Sailor or Airman. We are a 100% volunteer-based organization, so your entire donation goes to supporting our troops! We have been blessed to have touched the lives of over 350,000 Soldiers, Marines, Sailors and Airmen through our many programs over the past 16 years. Thank you to everyone who has participated in making this possible. We couldn't do it without YOU! we can continue this very important program. Only $15! Girl Scouts in the Fort Campbell area had their soldiers' backs this cookie season, helping to get them 41,000 boxes of Thin Mints, Samoas and Do-Si-Dos. For the eighth year, the Girl Scouts of Middle Tennessee adopted Hugs for Our Soldiers, a nonprofit organization based in Vonore, Tennessee, as their Gift of Caring recipient, the release said. 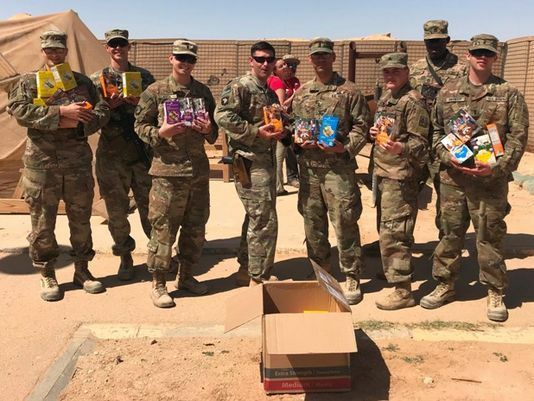 During booth sales, the Girl Scouts gave customers the opportunity to buy a box of cookies for a soldier. When the sale was complete, over 41,000 boxes were donated to Hugs.